You’re in the market for a bag of copepods (pods) but you’re stuck between choices. Company A claims a whopping number of pods, but its bag is virtually see-through. Company B’s bag looks promising, but it claims such a low pod number that you wonder if there are more “fillers” than pods. All too often, fish owners find themselves shot in the dark when it comes to knowing how many copepods they’re really getting. When purchasing pods, it’s important to keep in mind that live pods are in a constant cycle of growth and could vary in their sizes tremendously (FIGURES 1, 2, and 3), depending on the growth stage they’re in. 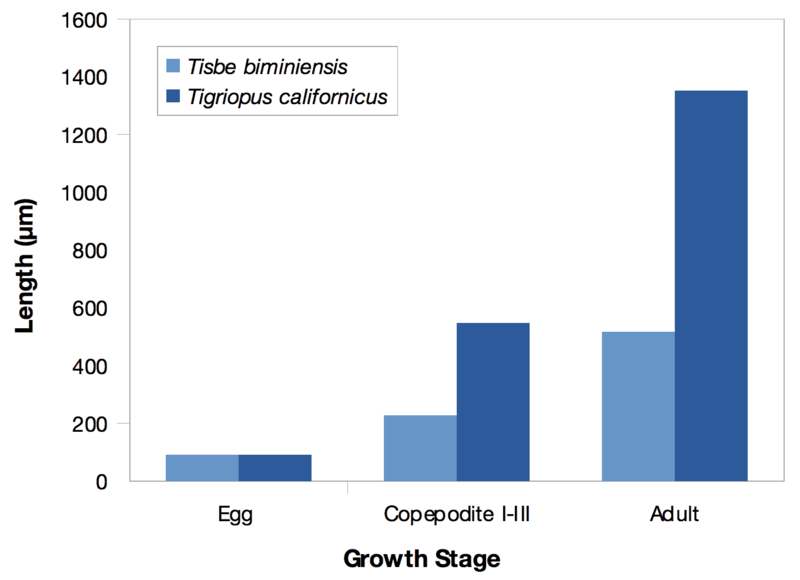 FIGURE 1: Variations in mean size (μm) from egg to adult in Tisbe biminiensis and Tigriopus californicus (Pinto, Souza-Santos, & Santos, 2001; Powlik, Lewis, & Spaeth, 1997)1. Depending on the pod’s growth stage, its body size can vary greatly. Eggs and copepodites can continue to progress through growth cycles while in storage and in the fish tank. 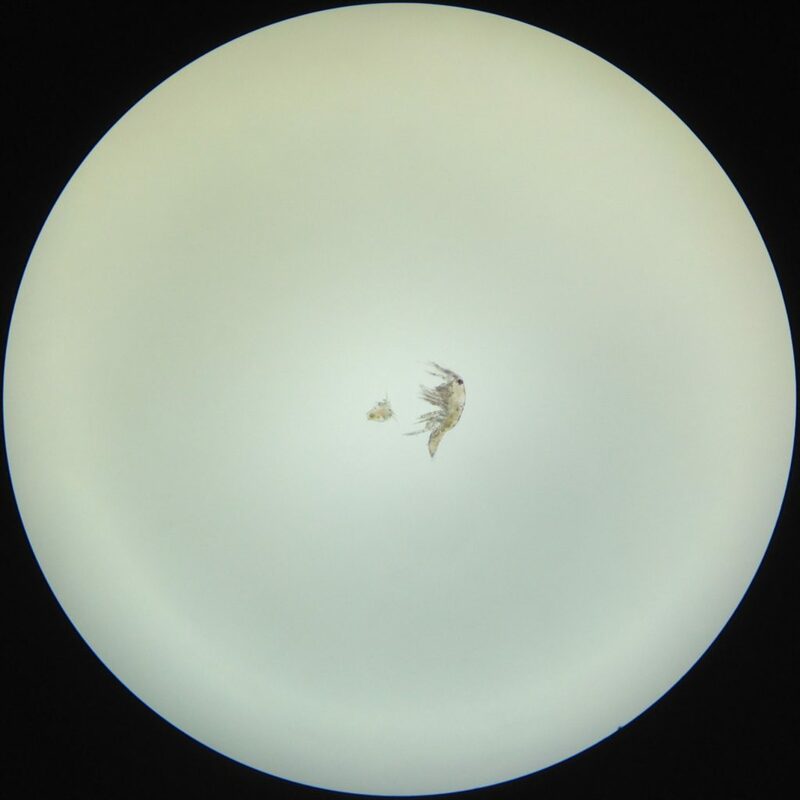 FIGURE 2: Size difference between Tigriopus californicus copepodite (left) and adult (right) from Poseidon’s Feast product line at 40X. Poseidon’s Feast bags are gas-permeable and include nutrients to maximize pod growth during shipping and storage. 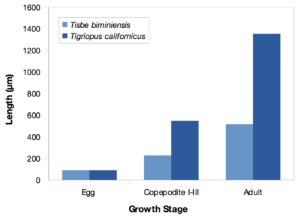 FIGURE 3: Size difference between Tigriopus californicus adult (left) and egg (blue arrow; lysed) from Poseidon’s Feast product line at 100X. Poseidon’s Feast bags are gas-permeable and include nutrients to maximize pod growth during shipping and storage. Because pods have the potential to progress through their growth cycles—during transportation and storage or while in the fish tank—knowing the total count is more helpful than simply having a few large pod sizes catch your attention. So, the bags of both Company A and B could contain the same number of pods, but one might contain a greater number of eggs and copepodites while the other might contain a greater number of mature pods. 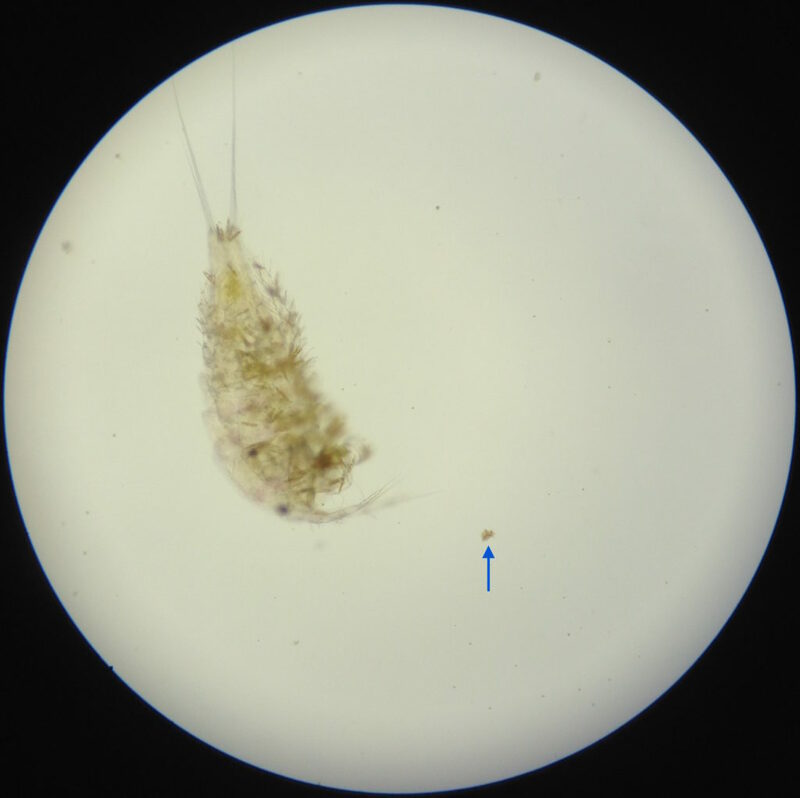 In this white paper, we illustrate one way to estimate pod counts by showing how AlgaeBarn determines pod densities in its Poseidon’s Feast copepod blend product line. 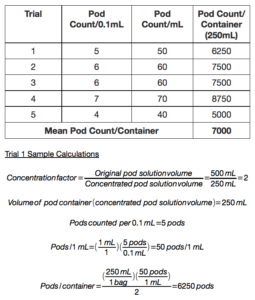 The number of pods in a container can be estimated by counting the number of pods from a small sample and, through a series of proportions, calculating an estimate of the pod number in the entire population (FIGURE 4). FIGURE 4: Overall approach to determining a pod count estimate. A sample count from a container of pods usually can be directly used to estimate the total population number of pods (green arrows). If desired, the pod solution could first be either concentrated or diluted before counting if the solution is too light or dense, respectively (orange arrows). The concentration or dilution factor would need to be accounted for during estimations. A compound light microscope with at least 40X magnification, which can be used to visualize pods of all sizes—from nauplii to adults—should be used. It is important to note that these methods only account for visible pods. Because eggs and early stage nauplii are excluded, the actual number of pods is likely to be even greater than the estimate. The pod solution should first be inspected to see whether or not it is at an optimal density—not too many nor too few pods —for counting. After the pod solution is shaken well, a 0.1mL sample is dispelled onto a microscope slide; a 1mL syringe may be used to do this. Under 40X, the entire sample is inspected through the limited field of view of the eyepieces to evaluate pod density. If the container of pods being used is too dilute (i.e. you see too few pods in the sample under 40X; e.g. 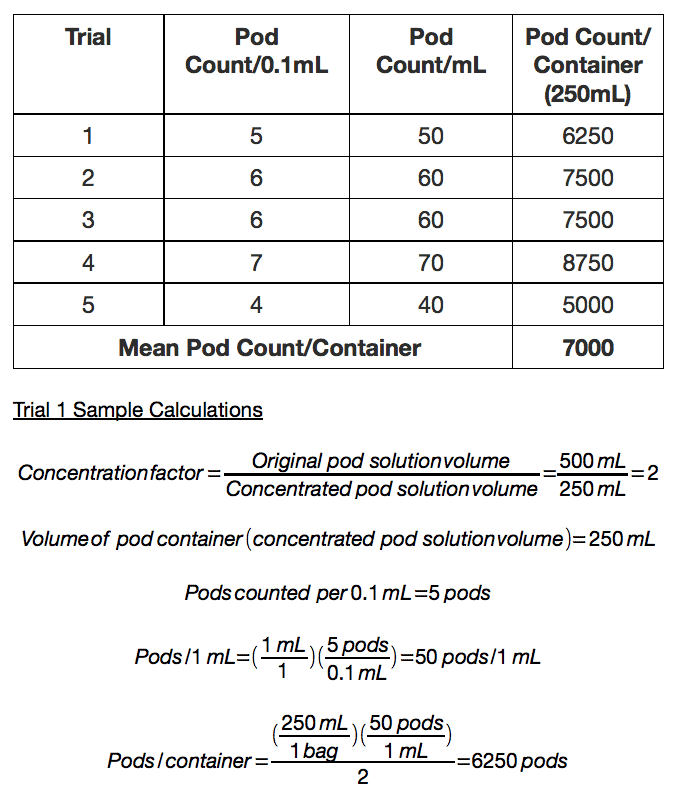 fewer than 3pods/0.1mL), then the solution should be concentrated and the concentration factor should be accounted for in the estimations; see “Concentrating Pod Density.” On the other hand, if the container of pods being used is too dense (i.e. you see too many pods in the sample; e.g. more than 15pods/0.1mL), then the sample should be diluted and the dilution factor should be accounted for in the estimations; see “Diluting Pod Density.” If neither concentrating nor diluting is necessary, then the pods are ready to be counted; see “Counting Sample Pods” directly. Before proceeding to any section, the pod solution volume (in mL) should be recorded; a graduated cylinder may be used for measuring (ensuring to lose as few pods as possible while transferring back and forth). Note that the suggested optimal pod density of 3-15 pods/0.1mL sample solution may be a good starting point, but ultimately the optimal density will be based on the number of pods/0.1mL you are comfortable with keeping track via the microscope. While a good starting point is to concentrate by a factor of 2, applying the following equation will allow you to use any concentration factor: One way a concentration factor of 2 could be achieved is by filtering exactly 1⁄2 of the original solution volume (as measured by the graduated cylinder) through a mesh filter (e.g. 50μm)— capturing all pods while removing liquid. Once the captured pods have been transferred back into the remaining solution, the remaining volume (now the concentrated volume) could then be verified with the graduated cylinder, which should be 1⁄2 less than the original volume. While a good starting point is to dilute by a factor of 2, applying the following equation will allow you to use any dilution factor: The pod solution could be diluted by a factor of 2 by adding clean saltwater (sp. gr. 1.025) into the pod container equal to the volume of the original solution (as measured by the graduated cylinder). The diluted volume could then be verified with the graduated cylinder, which should be twice as much as the original volume. 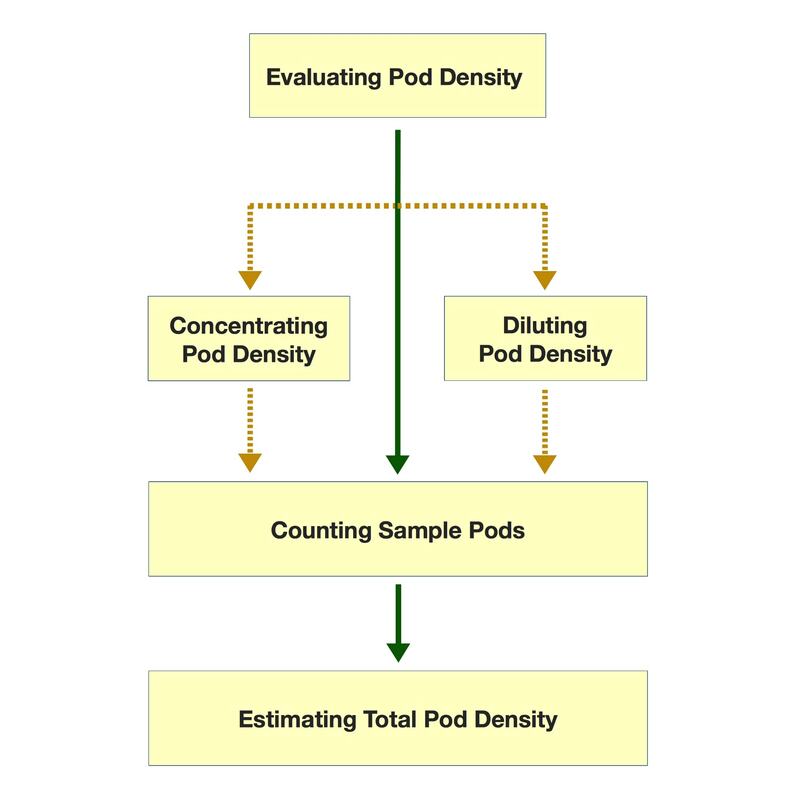 At this point, the pod solution should be at an ideal density for counting, either from concentrating (proceeding from “Concentrating Pod Density”) or diluting (proceeding from “Diluting Pod Density”), or because it was already at an ideal density (proceeding from “Evaluating Pod Density”). In order to count pods efficiently, they should first be immobilized. One way to do this is to mix the pod sample to be counted in an alcohol solution: after the pod solution is shaken well, a 0.1mL sample is mixed with 20μL of rubbing alcohol—transferred via pipette—in a microcentrifuge tube. The alcohol and pod sample mixture is dispelled onto a microscope slide. The goal this time is to pass and inspect every part of the sample through the limited field of view of the eyepieces, counting and recording down the number of every pod seen (in pods/0.1mL). Once counting is complete, the microscope slide is wiped clean and the process of immobilizing and counting a 0.1mL sample of pods is repeated several more times; having more trials will ensure a more accurate total pod estimate. While sampling without replacement is used, the volume of pods and solution removed in each trial relative to the entire container volume is so little that the effect would likely be negligible to the overall pod estimate. Once several trials of sample pod counts have been completed, the numbers will be used to calculate an estimate for the pod count of the entire pod solution (FIGURE 5). FIGURE 5: Sample calculations for determining a pod count estimate. As shown with arbitrary numbers, an overall estimate of pod count/bag can be determined using proportions with pod count/0.1mL. The above calculation shows a scenario in which the pod solution is concentrated before counting to illustrate how a concentration factor might be used. Sample calculations for other trials are similar to those of trial 1. For each trial, the pod count/0.1mL (from “Counting Sample Pods”) is multiplied by 10 to compute a pod count/mL. 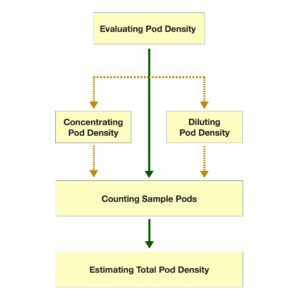 The pod count/mL is then multiplied by the total volume of the pod solution (from either “Evaluating Pod Density,” “Concentrating Pod Density,” or “Diluting Pod Density”). If the pod solution has been concentrated, then the product [(pod count/mL)(total volume of the pod solution)] is divided by the concentration factor; if the pod solution has been diluted, then the product is multiplied by the dilution factor. A pod count/container will thus be computed for each trial, and an average pod density estimate may be calculated by finding the mean of the pod count/container estimates. When purchasing pods, we often leap at the first sight of great size, frequently overlooking both the variety and number. While size is certainly proportional to nutrition content, it is more useful to bear in mind that pods have considerable differences in sizes and growth is continuous even during storage. Thus, the pod population density is an invaluable figure in determining the overall nutrition content in a container of pods. Using the methods in this white paper will allow fish owners to make more informed decisions when purchasing pods. AlgaeBarn consistently uses these methods to ensure the variety and pod density in each bag of Poseidon’s Feast. © 2015-2019 AlgaeBarn, LLC. All rights reserved.